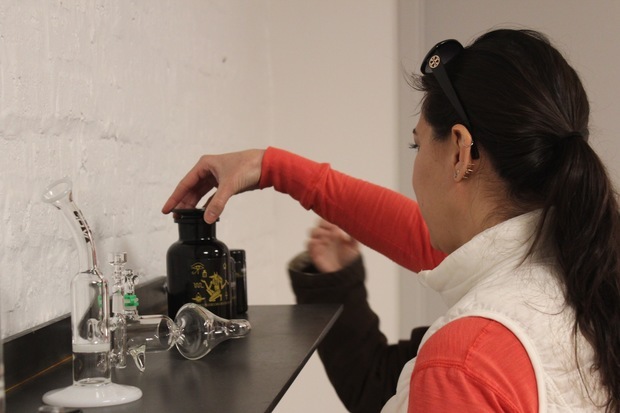 Dispensary 33 allowed neighbors and potential clients inside their shop this weekend. 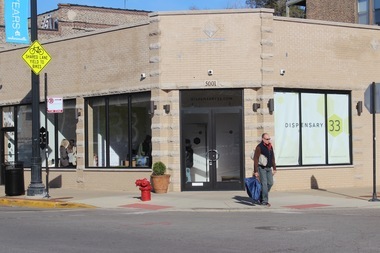 UPTOWN — About a year ago, The Cannabis Group LLC applied for a special use permit hoping to open a medical marijuana dispensary in the former home of Pie Hold Pizza Joint, 5001 N. Clark St. Since then, officials from the company have visited the Chambers of Commerce for Andersonville, Uptown and Ravenswood, aldermen for the 46th, 47th and 48th wards and neighboring block clubs seeking and receiving approval for their business plan. 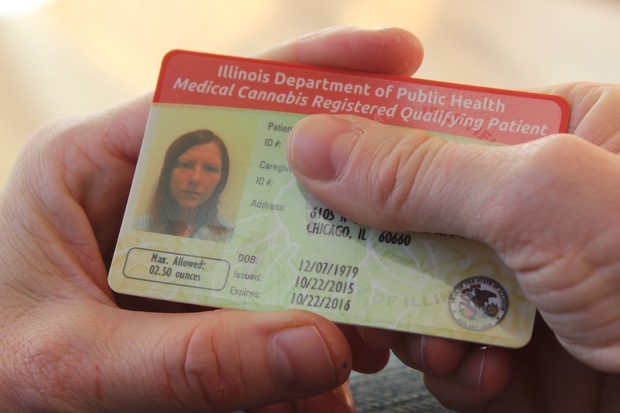 Over the weekend, just days after, medical marijuana sales opened in Illinois, the team that hopes to be the first dispensary to open in the city opened their doors early to the neighborhood. "People have no idea what the inside of these places are going to look like and if you don’t have a card you may never know what the inside of these places are going to look like," said Richard Park, who's in charge of research and client education at the shop. "Since we got such good public approval, we thought we owed it to the community to be like, 'come check us out.'" Saturday and Sunday, neighbors, future customers and anyone interested in knowing more about the shop were invited in to ask questions, learn about signing up or just take a peek inside the shop. "We wanted to do this to show the community that we were doing what we said we would do: that we’re going to make a beautiful storefront, that we’re going to be a benefit to this neighborhood, [that] it wasn’t going to be a shady kind of place. We’re not one of the companies that wants to hide in the shadows because we don’t think we’re doing anything wrong," Park said. "We don’t think there’s anything wrong with medical cannabis. 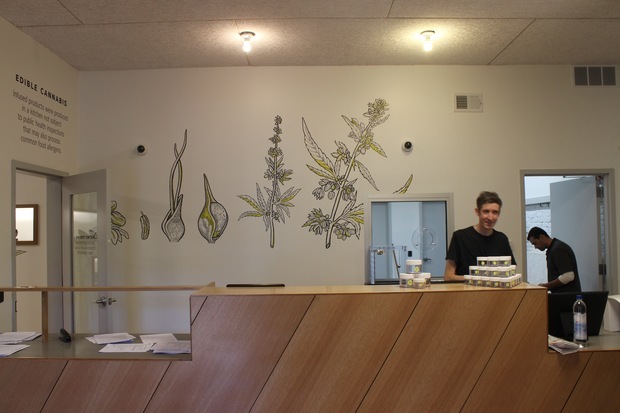 We think we’re helping people and you’ll see if you go talk to other dispensaries, the difference between us and other people is we’re true believers. We believe this works and we believe we’re helping people. If it was just about the money we wouldn’t be involved," he said. Normally, when someone enters the facility they check in with the agent at the counter, who verifies they are in the state database. Then they're buzzed in to the retail space, explains Park. Because there was no medical marijuana in the facility this weekend, that door remained open, allowing a peek at the shelves of marijuana-related books, custom glass pipes, display cases with origami pieces where the product will eventually be, along with a huge counter for sales in front of a bullet proof glass window where the marijuana is dispensed, Park said. 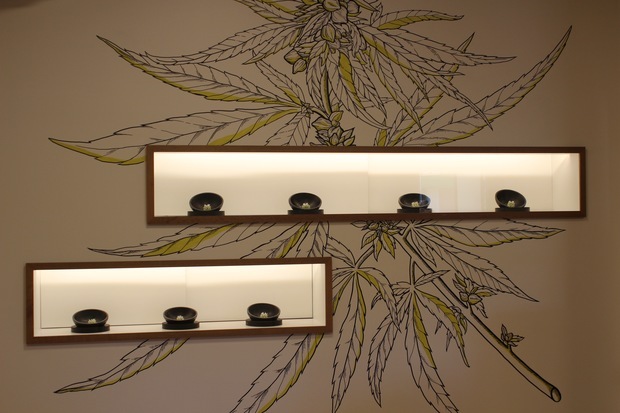 When the shop opens (an exact date has not been set), about 7-10 strains of marijuana will be available. Within the first couple months, concentrates, commonly referred to as "wax" or "dabs" will become available. Edible products containing medical marijuana should be available at the shop by January, Park said. "By February, we should we have the suite of products... We’re offering a range of quality cannabis products," said Park. "We believe in curating the kind of selection, so you’re not going to see really cheap ones here." 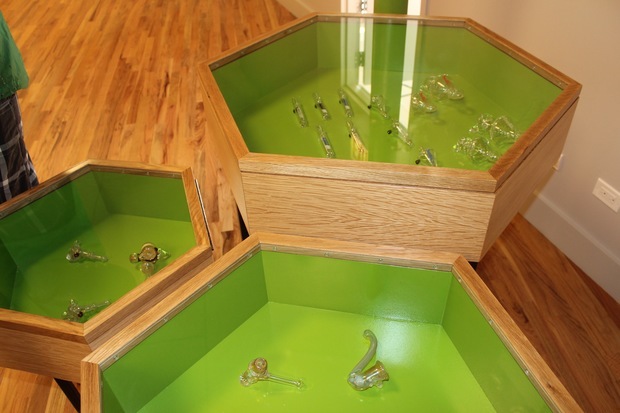 The shop also focuses on selling high-quality glassware, including handmade pipes fumed with silver by Bob Snodgrass, "widely considered the person who invented this style of glass fuming," Park said. Some of the pipes retail for about $800. 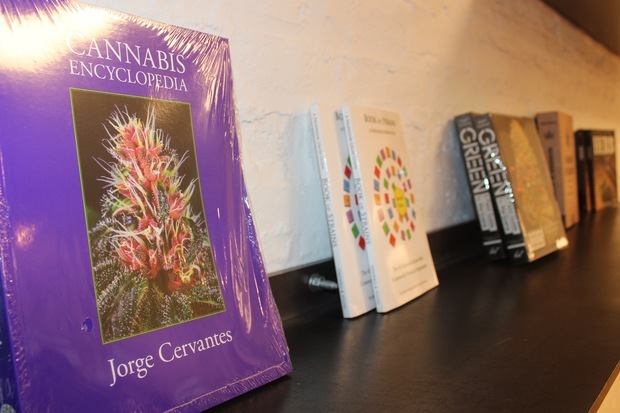 In the back is a stock of vintage rolling papers from 1977, "when New York decriminalized weed, technically," and JOB rolling papers from Chicago's first head shop Adam's Apple, who were at one point their "only distributors in the entire country," he said. "The idea is whatever you need we want you to be able to get it here. But you’re not going to find a five dollar [pipe] here," said Park. "These are all hand-blown and all unique. I contact the artist myself and we negotiate price piece-by-piece. We know our products really well, from cannabis products to these kind of products." The shop will not only have high quality products for their customers, but also a staff that knows and understands the struggles of the industry and the problems, Park said. Employees like Sue Cook, who has worked in acupuncture for three years and suffers from fibromyalgia. She plans to work as a "budtender" at the facility. Cook said she was happy to see the community response as customers and curious citizens flooded the store this weekend seeking more information. "It's been nonstop since noon, some people from the neighborhood and a lot of people have just been waiting to sign up," she said. "This is the first time it's really been a 'pro' that I'm constantly in pain. It's like, I know what it's like," said Cook, who said she feels empathy for patients after her own experience with medications for Fibromyalgia that "don't really work." "They give you antidepressants... but haven't found anything that really helps." Cook, who applied for her medicinal marijuana card in June, said she saw similar problems with her acupuncture patients. People don't come for therapy "unless there's something that's not working," she said. The products and the employees reflect the company's dedication to a high quality business, Park said. "Our philosophy is [that] there’s a right way to do things, and we don’t like corner-cutting, we don’t like short cuts. It just leads to problems down the line," Park said. There will be a ribbon cutting at the facility Monday at 10 a.m.